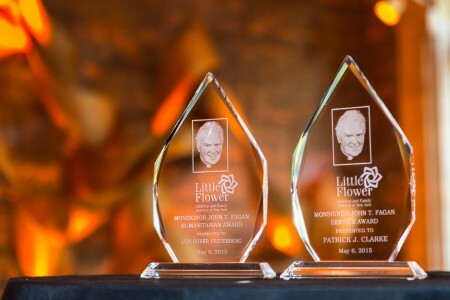 Each spring, Little Flower hosts the Monsignor John T. Fagan Awards, celebrating our history and mission, and recognizing those individuals and companies who exemplify our mission to serve children and families. The dinner is named in honor of Monsignor John T. Fagan, under whose direction Little Flower grew and prospered into one of the largest children’s service agencies in New York State. This annual fundraiser brings together Little Flower donors, supporters, caregivers, foster families and others to recognize the important work done by the organization over the past year, and to honor those who stand out for their commitment and philanthropic spirit. The Humanitarian Award, first presented to Monsignor Fagan in 2003, keeps alive the legacy of his commitment as Little Flower continues to serve children at risk and the developmentally disabled in New York City and across Long Island. Maura Manning, Senior Vice President, Ralph Lauren Corp.
2010 – Barry Jacobson and Larry Wohl, Joseph P. Day Realty Corp.
2006 – Dr. Steven A. Victor, Chairman & CEO, IntelliCell BioSciences Inc. The Service Award, inaugurated in 2013, recognizes and encourages the spirit of service that Msgr. Fagan championed throughout his tenure at Little Flower and over the course of his life.